Our new class session this week started off with some killer performances - Corporate Kirk is pounding on the keys now and doing smokin' originals, Jim Lucas has discovered his gritty side and laid down some very cool Magic Slim and we welcome Seydel endorsee, Cristian Inostroza all the way from Chile who'll be studying with us for a few months! Shoji took his playing time to give a demonstration of his song-learning technique - very cool! And Joe got us fired up for a good session. Remember to be working on recording yourself for the end-of-year contest; keep in mind that Joe has quick forms to fill out to facilitate critique of your playing; and get ready for some exciting special guests in class the next couple months! There were a lot of follow-up questions from people last night too regarding amplifiers so we spent some time discussing amp purchases and decisions. Remember that there are people in class who can help you with knowledge and advice if you're shopping, so ask around and consider borrowing things to get a feel for what you need. Those who turned out last week for the Pocket Full of Soul screening had a great time. The film was impressive, complete with a lot of B1 sightings - Joe was featured, of course, but we also got to see Zoe and Big Jim (rightly dubbed Walter Horton historian) on camera, plus fleeting glimpses of other classmates. Not to mention the fact that a huge percentage of the pro players featured have been kind enough to visit us in B1, so we felt like they were all our friends up there on the big screen! Some of us at the Pocket Full of Soul screening had a chance to meet Phil Moy from the relatively new Little Walter Foundation. Turns out Marion Diaz Reacco, Little Walter's daughter, lives right here in Chicago and she and others have launched the foundation with the mission to "preserve and extend the legacy of Marion Walter Jacobs" as well as to "create programs to motivate, engage and inspire children everywhere in the creative arts." These are certainly ideas we can get behind! And of course, we're huge Little Walter fans. We look forward to welcoming Phil and Marion in B1 before too long. In the meantime, check out their website and support them if you can! Gimmick aside, this guy has a killer train imitation: David Sanders. Also, check out these terrific videos from Sam Hinton. In honor of Black History Month, American Masters recently ran this special on Sister Rosetta Tharpe. Incredible in her own right, we hear Walter Horton makes some appearance on the show! The Godmother of Rock & Roll. Next week Joe will have a very special guest in the Rhythm & Chording class - Bau Graves, executive director of the Old Town School, is coming in to play his accordion and Joe will demo and make comparisons to the harmonica. Don't miss it! Announcing new play-along tracks from our own Shoji Naito, now available on iTunes and at Amazon! 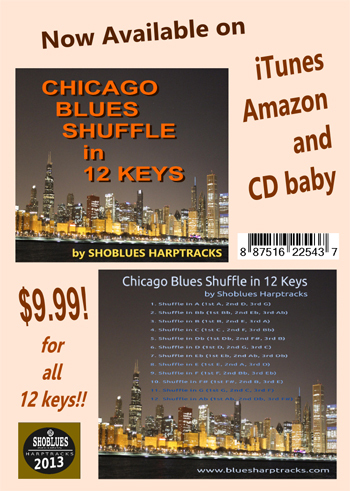 New Blues Mystery Novel From Ricky Bush!!! "I'm sending out a short note to let those that don't know that THE DEVIL'S BLUES has been released and is available. For those that read my first crime novel, RIVER BOTTOM BLUES, it continues the adventures of the crime fighting blues playing duo of Mitty Andersen and Pete Bolden. Right now it is available on Amazon in the print version. It'll be released in eBook formats soon and also on Barnes and Noble and at half a dozen other retailers over the next couple of weeks. My publisher offers all the eBook version right now and also a FREE four chapter PDF for those who like to sample before purchasing. Find them at: www.barkingrainpress.org I offer signed copies on my website and blog listed below in my signature. Thanks for reading my blatant self promotion.